Hollybeary Creations : Kindness with the Divas!! Happy Thursday... this is my second post today so if you are looking for the Right at Home eBook hop please click here. I've got a fun watercolor card using a few of the newest additions to the Two Paper Diva Line. 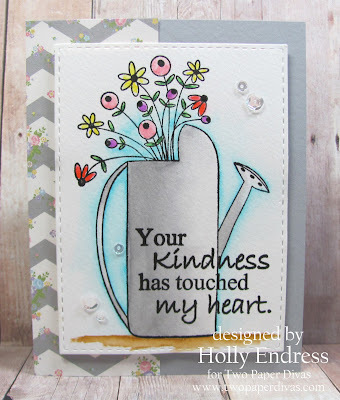 The watering can image is a cute new set called Bloom Wildly and the sentiment is from Everyday Sentiments #2. 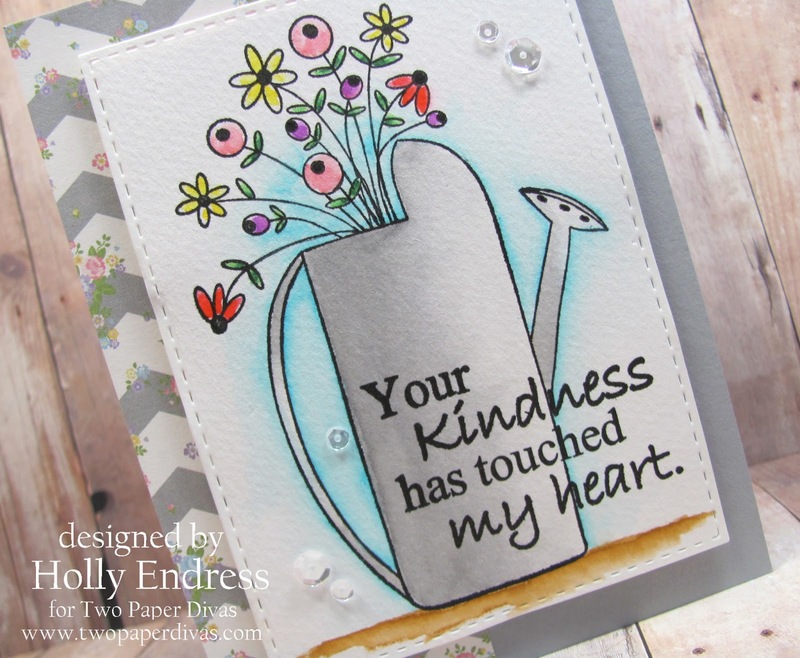 I stamped the watering can image onto a piece of watercolor paper using some VersaFine Black ink and then I watercolored it using the Zig Clean Color Real Brush markers. I stamped the sentiment over the image using the same Black Ink. Once everything was dry I die cut the panel using a stitched Rectangle die. I created a Light Grey card base and I added a strip of pattern paper along the one side. Then I added the die cut image panel using some dimensional adhesive. For a touch of bling I added some Sparkling Clear sequins from Pretty Pink Posh. Head over to the Diva Blog to see more inspiration from the Team! Beautiful card, Holly. Amazing coloring job! Love the sentiment with this watercoloring can, too.